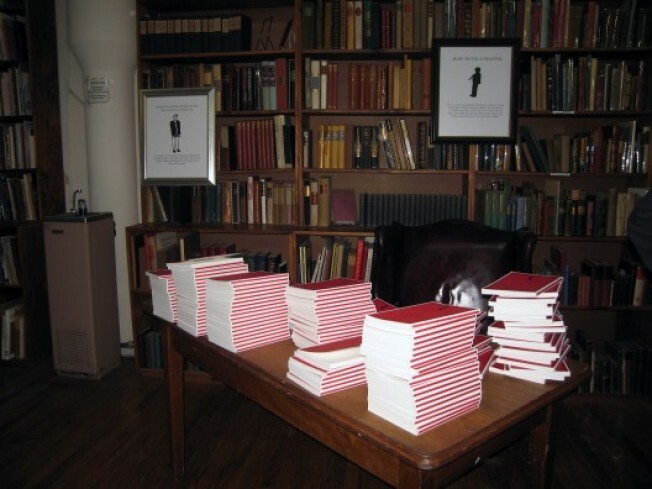 Last night, J.Crew hosted a reading of their new book What a Man Should Know. The venue was the rare books room at the Strand, a suitably dusty and removed space on the third floor of a building next to the store at 826 Broadway. The little red volume, penned by British author Max Blagg and illustrated by Hugo Guinness, was stacked about the space. Well-dressed guests, among them J.Crew CEO Mickey Drexler, flipped through it while sipping from complimentary cocktails or noshing on little short rib-filled pastries. Then, Blagg stepped up to the podium to read through a few of the 50 things a man should know (example: A man should know what to say to a sommelier. Not much. Let him impress you with his knowledge, and find you a wine that is both delicious and reasonably priced.) The tips were well received, but the laughter really began when Blagg moved on to selections from a ribald work-in-progress.